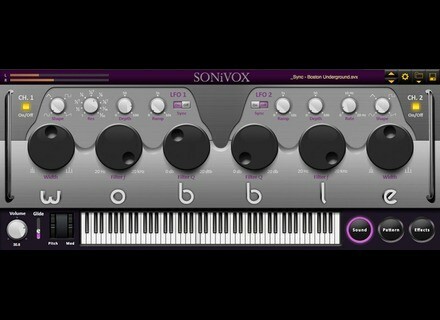 Wobble, Other Virtual Synth from SONiVOX MI. The SoniVox MI Wobble is the perfect VST plug in for grime and dub step music. You can use it as a stand alone or a plug in in any DAW you want. It will work with your Mac or your PC software and it costs less than 100 dollars. At this price, for the quality of the MI Wobble you won’t spend that 100 dollars in a better place! If you love to design sounds then the Wobble will let you do that and do it easy and quickly. There really are not too many parameters to mess with in this VST. Its pretty simple, basic and to the point. There are some effects on this VST, Chorus, Delay (that can be tempo synced) and Reverb. It would be nice if it had some more effects but you can use your mixer for any other effects that you might want. It comes with 200 + presets that are dubstep and grime influenced. Most of those sounds are really fat and rich, you can edit them very easily just by tweaking and turning some of the knobs on the VST dashboard. All of the effects are generated in real time too. Setting this VST up only takes a few seconds, it is a pretty small VST and it does not take much computer space (hard disk) or CPU to run it. You just need a PC with 512MB of RAM and be running Windows XP or higher. On a Mac you need OS version 10.5.1 and up with the same about of RAM (512MB). There aren’t many VST plug-ins that can give you this really good fat dub sound that the Wobble can do. At this price you will not find any VST that can come close for dub and grime. If you are not into dub or grime then don’t waste your money getting this because most of the presets are heavily designed around dubstep music. Sonivox has released their Dubstep Grime Generator - Wobble featuring new technology synthesis engine that is coupled with pattern sequencer modulation control.